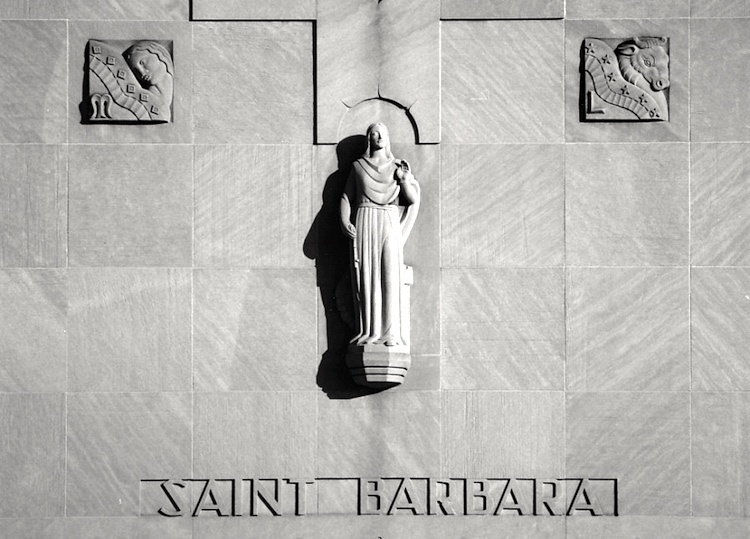 Today is Saint Barbara’s feast day. Draw near and sit with me, for today’s telling of the lives of the saints. There will be miracles. Saint Barbara, Feast Day December 4, known in the Eastern Orthodox Church as the Great Martyr Barbara, was an early Christian Greek saint and martyr. Accounts place her in the 3rd century in Heliopolis of Syria, present-day Baalbek, Lebanon. There is no reference to her in the authentic early Christian writings nor in the original recension of Saint Jerome’s martyrology. Her name can be traced to the 7th century, and veneration of her was common, especially in the East, from the 9th century. Saint Barbara is often portrayed with miniature chains and a tower. As one of the Fourteen Holy Helpers, Barbara continues to be a popular saint in modern times, perhaps best known as the patron saint of armourers, artillerymen, military engineers, miners and others who work with explosives because of her old legend’s association with lightning, and also of mathematicians. … According to the hagiographies, Barbara, the daughter of a rich pagan named Dioscorus, was carefully guarded by her father who kept her locked up in a tower in order to preserve her from the outside world. Having secretly become a Christian, she rejected an offer of marriage that she received through her father. … Saint Barbara’s Day, December 4, is celebrated by [a large assortment of British, Australian, Canadian, and New Zealand military artillery units]. … Saint Barbara’s Day is celebrated by United States Army and Marine Corps Field and Air Defense Artillery, many Marine Corps Explosive Ordnance Disposal Technicians. The units and sub-units celebrate the day with church parades, sports days, guest nights, cocktail parties, dinners and other activities. Several mining institutions also celebrate it, such as some branches of the Australian Institute of Mining and Metallurgy. … In the mining town Kalgoorlie, Australia, as patron saint of miners she is venerated in the annual St. Barbara’s Day parade. Mysterii Paschalis is an apostolic letter issued motu proprio (that is, “of his own accord”) by Pope Paul VI on 14 February 1969. It reorganized the liturgical year of the Roman Rite and revised the liturgical celebrations of Jesus Christ and the saints in the General Roman Calendar. … Progress in historical and hagiographical studies led to distinguishing three classes of saints included in the 1960 calendar that it seemed better not to keep in the revision. One class is that of the saints about whom there are serious historical problems. It cannot be affirmed that they did not exist, but the lack of clear grounds for venerating them led to their exclusion from the 1969 calendar with the single exception of Saint Cecilia (22 November) by reason of popular devotion to her. Another class is that of those ancient Roman martyrs about whom there is clear historical evidence but of whom little, if anything, is known other than their names, with the result that they have little meaning for the faithful of today. A third class is that of the founders of the ancient Roman churches known as tituli and about whom there exists a specific genre of legends. For lack of evidence that they were martyrs or confessors, as pictured in the legends, they were excluded from the revision, again with the single exception of Saint Cecilia. Changes by removal from the general calendar include: St. Valentine (14 February), St. John and Paul (associated with the Pied Piper legend— 26 June), St. Christopher (25 July), and St. Barbara (4 December). … In 1924 Parducci traveled to Detroit to work for [Albert] Kahn, only planning to stay for a few months. However, with the automotive industry booming in the 1920s, Parducci moved his family to Michigan and ended up spending the rest of his career working from Detroit. 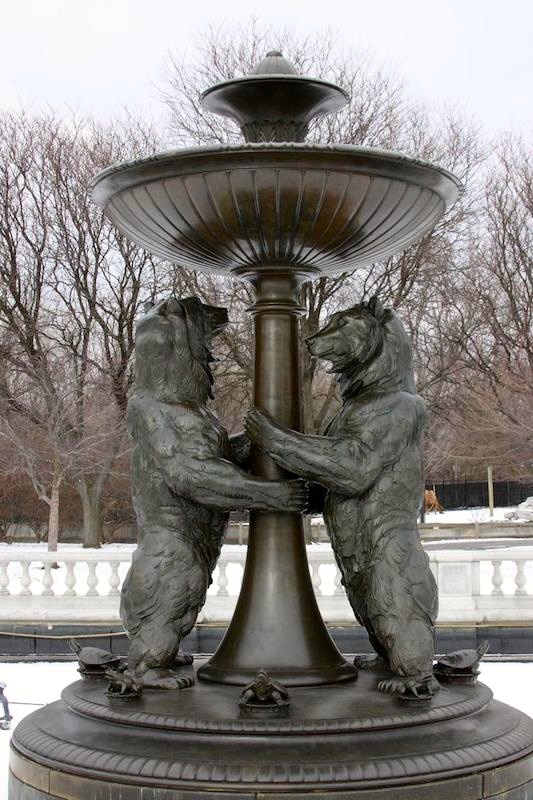 … Parducci’s work can be found on many of the Detroit area’s finest buildings including churches, schools, banks, hospitals and residences. His sculptures can be found in most major Michigan cities including Ann Arbor, Dearborn, Flint, Grand Rapids, Jackson, Kalamazoo, Marquette, Royal Oak, Saginaw, and Ypsilanti. This entry was posted on December 4, 2018 at 5:18 pm and is filed under Art, Holidays, Language and religion. You can follow any responses to this entry through the RSS 2.0 feed. You can leave a response, or trackback from your own site. Love this. A US Army veteran, I had no idea of the Army’s devotion to the saint. In Afro-Caribbean Santería. because of the sword of her martyrdom she represents Changó. I had an old lover, long of blest memory, named Barbara, who had a devotion to the saint, but in deference to present company I shall not say more of my horny old fat woman. December 4th was also my Dad’s birthday. His birthday on the first week of December, my brother Mike’s (Dec. 11th) on the same weekday in the second week, and “Nothing” day (Dec. 18th–“Nothing Tuesday” this year) in the 3rd week were all followed by Christmas Day on that weekday the 4th week of the month. I always thought the candles in my mother’s Advent Wreath corresponded to our family’s celebrations. It’s a busy — and mostly very mortal — week. The 4th is St. Barbara, and also Frank Zappa’s death day. The 5th is Krampusnacht. The 6th is St. Nicholas, Mozart’s death day, and Finnish Independence Day. The 7th is Pearl Harbor Day. The 8th is John Lennon’s death day.